Wow! Finally a lovely spring day....a day I've been dreaming about forever. I am hoping I can get outside for a run today! Even the birds are chirping. I love it! 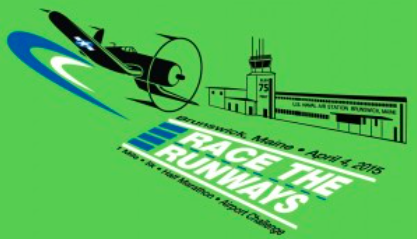 And I'm going to block out the weather for tomorrow's 14.1 Airport Challenge at Race The Runways and pretend the weather forecast is wrong (cold, rain, snow, wind). As the weather improves, my treadmill running days are going to slowly come to an end. I spent a ton of time on the treadmills at my gym this past winter and spring. Gone are the days when I tough it out. I'd rather be safe, warm, and not get injured. This brings me to What's In My Gym Bag? I bought these shoes a few months back just for the treadmill. We have signs at my gym asking members to wear clean dry shoes on the treadmill, so it makes sense to follow this rule! Clean dry shoes keep the equipment running well and I want those treadmills to work - so I listen. After running, I want to put something rather comfy on my feet. Oofos is perfect! Plus, I can wear ProCompression socks with them. Treating my feet after a hard workout is key. This little ball is perfect to keep in my bag! I love the Bodyworks Ball for rolling out my feet and rolling my back or glutes. The ball is small like a tennis ball so you can get right in there and hit those pressure points quite well but you have the attached handle to control where it goes - which helps even more! I've even pulled this little awesome ball out for my IT band. Oh the tears...but it hurt so good! I love that it's easily portable and I can roll anytime. And I have to say it's been a fave amongst the marathoners in the family here. Disclaimer: I was sent the Bodyworks ball to review. I was not compensated for this post. As always, all opinions expressed on my blog are 100% my own. Bodyworks Ball Fitness Friday Marathon Training OOFOS procompression skechers What's in my gym bag?